The SAM Splint is a high quality emergency splint that can be used in everyday situations like hiking, mountain climbing, camping, boating, four wheeling, sports and automobile accidents to immobilize broken bones and injured limbs. These splints are especially important if you or a friend has an unfortunate accident resulting in fractures or related injuries / sprains and you are in the wilderness and medical care is miles away. This medical device makes an exceptional preparation for Doomsday preppers and a long term survival scenario. See the instructional videos below for demonstrations of how to use a SAM Splint in many different applications. The SAM Splint is the gold standard in splints. These splints are lightweight, portable, compact, washable, reusable and are very versatile splints designed for immobilizing bone and soft tissue injuries in an emergency situation. The SAM Splint consists of .016 inch thick strips of soft aluminum that is coated with polyethylene closed-cell foam. It makes the ideal portable splint for preppers, hikers, and any outdoor sports. For some fractures such as immobilizing the knee, two SAM Splints are required, so it is recommended to have a minimum of two SAM Splints. The Sam Splint Combo Pack is a great value as it includes two 36" SAM Splints and two 3" rolls of Blue Cohesive Wrap. Cohesive wrap sticks to itself and does not stick to skin or hair. 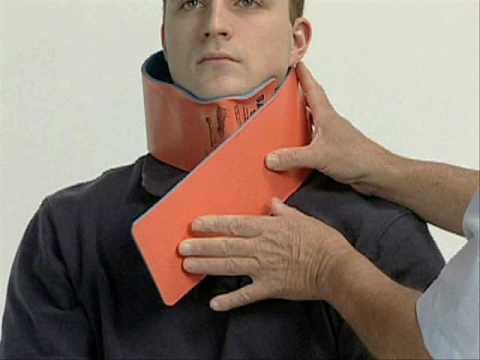 This makes it the ideal wrap for holding SAM Splints in place. SAM Splints can even be used on pets to immobilize their injuries. The SAM Splint is extremely moldable, is soft enough to cut with ordinary household scissors, and can be used to splint every bone in the human body. 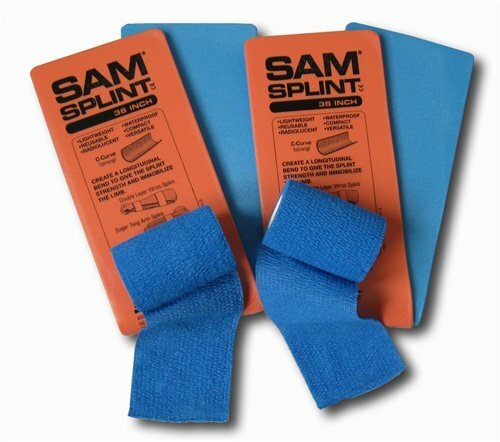 SAM Splint 3X Combo Pack Orange/Blue Flat 36"
"The perfect all around splint for any first aid kit." "This is an Awesome product! I've had lots of experience applying them on patients and they work great. Must have on any trip or activity..."
"I just completed a Wilderness Survival First Aid kit taught by a Sheriff & EMT and he couldn't say enough good things about these versatile splints. I like the 2 pack bought here on Amazon as they come with the clip-less wraps also. Great price too." "These are very handy to have around. A definite must-have for any EMT@home kit or anyone who plans ahead for first aid. My wife (who is a doctor) saw these and immediately saw their potential use. I'm just a backpacking buff and plan for the worst." "I have several of these in my car kit as well as my home and CERT kits. Nice addition to any trauma kit." "In excellent condition and easy to carry around. The splints were in excellent condition. I haven't used them yet but my sister who is an EMT says they are very good splints to have." "I've used these in the past on People, I am really hoping to never need to use them on myself. For a back woods first aid kit they will more than do the job. I am very pleased with them." "A must have item for any serious sports first-aid kit. You never know when you will need them." "Love these! I help with a wilderness training class and the students get to see them first hand. One had the hardest time giving it back to me. A must for any first aid kit." The following YouTube instructional video shows SAM Splint techniques and how to use them for arm & wrist break applications. 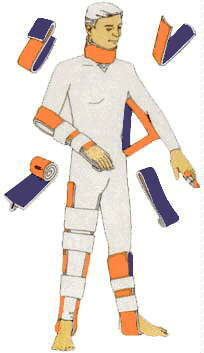 The following YouTube instructional video shows SAM Splint techniques being used in applications as a Collar (Neck) Splint, Knee Immobilizer (requires 2 SAM splints), T-beam Wrist Splint, Upper Arm (Humeral Shaft) Splint, Figure-of-Eight Splint (ankle & foot), Dislocated Elbow Splint, SAM Pelvic Sling, and Improvised Pelvic Splint Using A Sheet. The following 30 minute YouTube video shows SAM Splint techniques and instructions for Finger Splints, Thumb Splints, and many more applications. Through corresponding directly with Dr. Ryan Chamberlin, he frequently recommends the SAM Splint as an essential medical device for Doomsday Preppers. Dr. Chamberlin is the author of the medical survival book Surviving the Zombie Apocalypse: First Aid Kit Building and Mini Med School for Preppers. See the YouTube videos above for how to properly use the SAM Splint in many applications and techniques. Also see the two Blogs (links immediately below) from ThePrepperPages.com for more details from Dr. Ryan Chamberlin concerning treating broken bones. Additional pictures are provided below as well. To see more medical items that Dr. Ryan Chamberlin (trauma surgeon) recommends for preppers, click "Medical & Dental" in the navigation bar in the upper left. Please check back as more medical items are added in continued collaboration with Dr. Chamberlin. Use at your own risk. Please note that the information provided on this web page is for information only. TopSurvivalPreps.com and it's owner have no liability or responsibility for anyone using any items described on this web site including for any SAM Splint applications.